Hear your music like never before with Ultimate Ears WONDERBOOM, the super-portable Bluetooth speaker with surprisingly big sound that is clear, crisp, and full of big, beautiful bass. With 10 hours of playback and a completely waterproof design, you can bring it in the shower, to the pool, the beach and to everywhere in between. And if you need to really turn things up, quickly pair two together for even more sound. IPX7-rated waterproof (up to 30 minutes and a depth of 1 meter). Drop tested from 1.7 meters height. Actual battery life will vary with use, settings, and environmental conditions. Rechargeable batteries have a limited number of charge cycles. Ultimate Ears WONDERBOOM packs huge sound into a pint-sized speaker. Toss it in your bag or use the hang loop to strap it to your backpack. It’s made to go anywhere. Just add friends. It’s the greatest thing to happen to baths since bubbles and duckies. The speaker is completely waterproof, floats, and yes — it will even serenade you. And it’s also great for showers, pools, beaches, waterfalls, muddy fields and rainy days. If it gets dirty, just rinse it off. 10 hours of battery life gives you a full day or night of musical ecstasy. A picnic in the park. Binge-watching shows from bed with furry friends. 10 hours of non-stop entertainment with brilliant, immersive sound. If you think one Ultimate Ears WONDERBOOM sounds great, you’ll love how they sound together. Press a button on each to pair them up. Then turn things up, get a little crazy and dance like nobody’s looking. Wherever you are. Hear your music like never before with WONDERBOOM, the super-portable Bluetooth speaker with surprisingly big sound. One WONDERBOOM speaker sounds awesome. Pair two and things get totally crazy. Press a button to wirelessly connect your WONDERBOOM to your friends’ WONDERBOOM. Take your parties to a new level. WONDERBOOM is your go-to accessory for conjuring the magic out of music. Enjoy big 360° sound that is bright, beautiful and with balanced bass. WONDERBOOM is the greatest thing for baths since duckies. It’s completely waterproof, floats and great for showers, pools, muddy fields and rainy days. If it gets dirty, just rinse it off. Be there all day, all night. From picnics in the park to binge-watching your favorite shows, WONDERBOOM gives you 10 hours of non-stop musical ecstasy. 10 hours of brilliant, immersive sound. 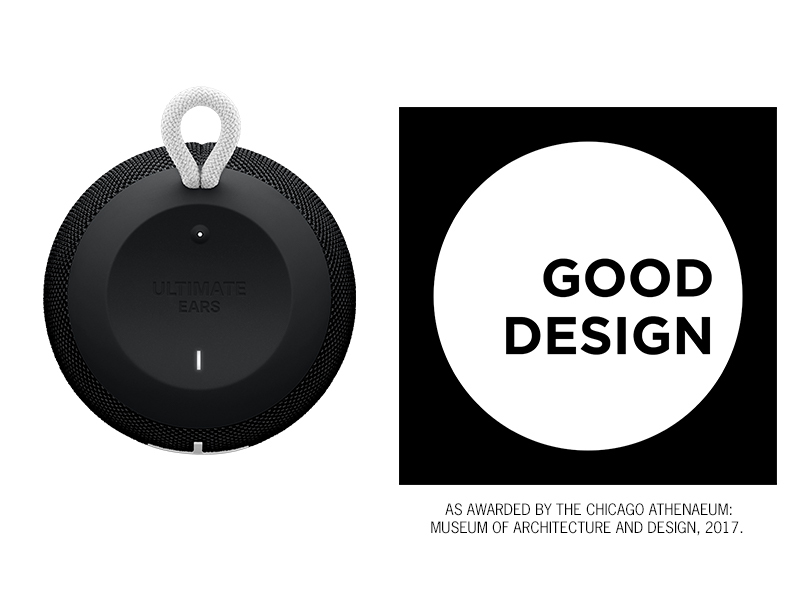 Good Design Awards Program – from the Chicago Athenaeum – is the oldest and among the most prestigious Global Awards Programs for Design Excellence and Design Innovation.